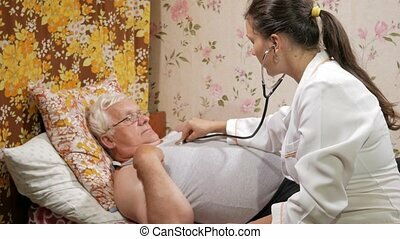 Doctor assisting a patient to lie o. Video of a doctor assisting a patient to lie on a bed in hospital ward. 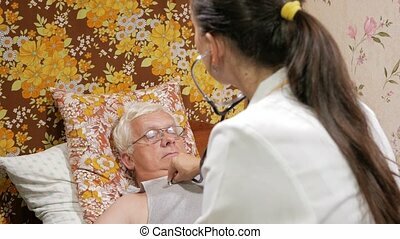 a young doctor enters the room,talking with the patient and tells him to lie down on the couch. 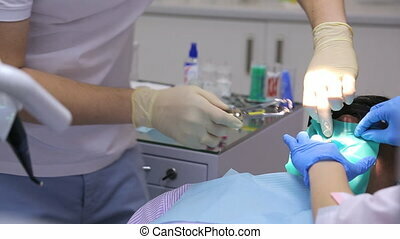 Male dentist performs surgery to restore tooth crown in a patient with nurse. At mouth of male patient who is having problems with front teeth in upper jaw, mounted medical cofferdam. Doctor, dentist carefully using special forceps on tooth sets metallic clamping device. Made with medical table filled with tools and fixtures. 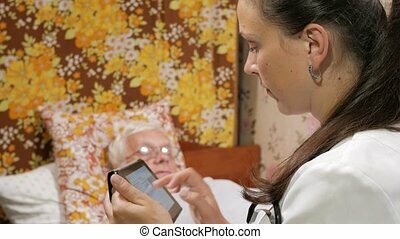 All work takes place under assisting nurse that helps doctor during surgery. 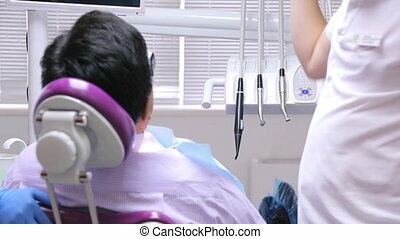 Desk dentist cluttered with tools, patient is in chair next to him nurse. On a small work table, doctor will prepare all necessary tools to work with man in chair. 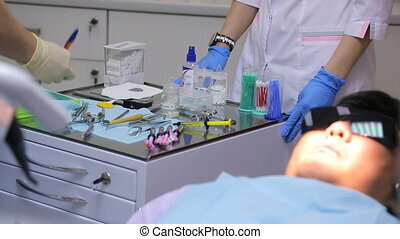 On this table lie syringes, clamps, tweezers, medicine and other different dental instruments and tools. Next to doctor, be a nurse who helps him during surgery. 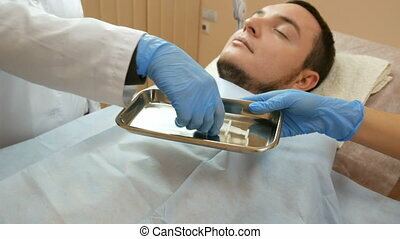 Specialist begins to wear a dental dam in oral cavity of patient. Redhead doctor making ultrasound of the abdomen of a young woman. 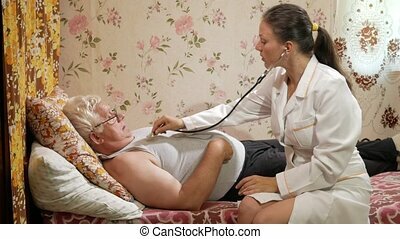 In the city polyclinic, the doctor in blue uniform examines the abdomen of the patient, who lies motionless on the couch. In the procedure room of the hospital, a specialist conducts a medical examination of a lean lady and looks at the monitor to analyze the data. In diseases of the gastrointestinal tract, ultrasound should be used to detect the cause of pain. At pregnancy also spend inspection. 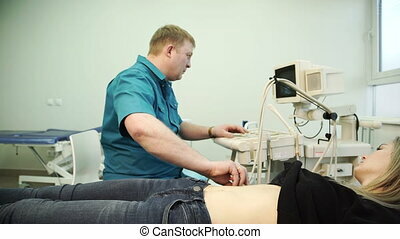 A pregnant woman lies on a couch in a clinic and a female doctor listens to the baby's pulse through the abdomen with the aid of an auditory doppler. Dentist selects right handpiece for dental unit, a patient is in chair. Patient lies in a comfortable chair and waits for start of operation. 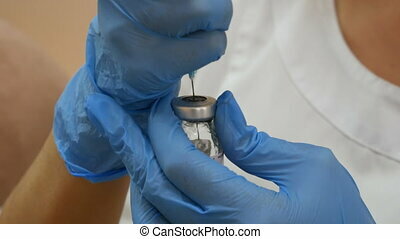 At this time, doctor selects most suitable tool with which to work. Dental handpiece is a device designed to impart to working tool to directional movement of a certain speed. For correct operation of dental handpiece must be fully driven dental unit. Distinguish electric and air actuators. A pregnant woman lies on a couch in the clinic and a woman doctor listens to the baby's pulse through the abdomen with the aid of an auditory doppler and.